Texas Housewife: I Am Tired of Being Sick! 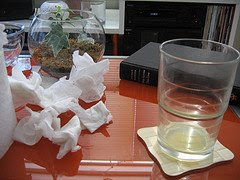 I Am Tired of Being Sick! A big pile of sick, that pretty much sums up life around here lately. Poor Dan just came home from work sick, again. He seems to have the same icky virus our neighbor has been fighting the last few days. The whole neighborhood seems to be just passing stuff around the past few weeks. We were both sick on Christmas Day as well. It seems both of us have been ill off and on for the six weeks or more. It has been no fun. I've fallen behind on the housework and he has used all his sick time at work. All these illnesses have been viruses and such, I'm sure flu season will bring more lovely sick time. Generally we all four get the flu at once. I can't tell you how happy that thought makes me! Lately I've been trying to figure out ways to prevent us from getting sick, or at least from sharing it. I've disinfected everything in the house more times than I can count. I preach at the kids to wash their hands constantly. Sickness abounds despite all my efforts. I am really beginning to think we need to be on multivitamins and immunity boosters. I've heard really good things about Beta Glucan, so we may give that a try. It is said to be a real help to your immune system and overall health. Anything that helps boost the immune system has got to be a good thing, especially with flu season coming on. I am so tired of being sick! This fall and winter seems to have hit our family especially hard. The past week we've had low temperatures in the 20s with highs in the mid 70s, which I'm sure is not helping anyone health wise. How about you? Has your family had more than it's fair share of the icky stuff lately? Is the weather being all weird where you live? I feel your pain! I was sick for over 20 days and am still working on antibiotic number two. New Year's Eve was ruined by a migraine! Get better soon! I so know how you feel!! I'm the only one that gets sick in my house though! My son never catches it from me. I make him stay out of my room!lol I guess that helps!